The Hon’ble Minister of Railways, Sri Suresh Prabhu has launched a special tour train package for the Indians on the occasion of World Environment Day on 5th June 2016.The train which will conduct this unique railway tour package is named as the Tiger Express. The announcement of this new train circuit to explore the Indian wildlife and the world famous tiger reserves for nature enthusiasts was hinted in the Rail Budget of 2017. According to the minister, the Indian Railways which is the largest railway network in the world is committed to save and preserve the environment and to rediscover its attractions. Tiger is the national animal of India and the idea is to explore the beautiful tiger reserves and sanctuaries of our nation by travelling through rail. How the inauguration of the Tiger express was done? The Railway Minister used the video conferencing to flag off the Tiger express. The train left Safdarjung Railway Station of Delhi for its first journey. However, the Railway Minister being not in the spot of flag off ceremony used video conferencing from Mumbai and started this Railway tour project on the World Environment Day. Several Railway officials and dignitaries were present in the flagging off ceremony at the Delhi’s station. Dr. H. Vardahan who heads the Ministry of Science and Technology was present along with Lok Sabha MP Meenakshi Lekhi. IRCTC is a recognized body of Indian Railways which looks after the reservation, ticket booking, railway organized tours, hotel booking, catering in railways, etc. IRCTC will administer the entire tiger circuit tour and will be responsible for the bookings, maintenance, tour guidance, etc. for this special tour. The online portal of IRCTC will be used for information regarding the tiger circuit train tour, seat availability, booking, cancellations, etc. The Tiger Express is expected to attract huge response from the nature and wildlife lovers. What is the journey period of Tiger Express? Tiger Express is the name of the train flagged off on World Environment Day, 2016 in Safdarjung railway station of Delhi. So the tour starts from Delhi, which is the source station. As per the project, this railway wildlife tour will be for a period of 5 days and 6 nights all total. The Tiger Express will leave for its magnificent journey in the afternoon at 03:00 PM. The first night will be spent by the passengers in the train itself. The train after its completion will return back to Safdarjung Railway Station, Delhi. After leaving from Safdarjung railway station of Delhi, the train will travel to Jalabpur via Katani and Kanha. The train will stop in all the important tourist destinations of the train circuit before arriving back to Delhi from Jabalpur. Bandhavgarh National Park and Kanha National Park are the two most important locations where the tourists will tour to explore Tigers. Apart from this, the journey will also cover tour to the famous Dhuadhar Waterfall. This natural waterfall is near Jabalpur. Jabalpur will be the last location of visit before boarding the Tiger Express and returning back to Delhi. 7 Helpline Numbers for Tiger Express Train www.irctctourism.com or tourism@irctc.com. Dial toll-free number 1800110139 or 9717645648, 971764718, 9717640219, 9717644085, 9717645625. In the Budget Sessions of 2016 earlier this year, the Rail Minister Suresh Prabhu clearly mentioned of the Indian Railways to operate more environment friendly in near future. In that call, he launched for this unique Tiger Circuit tour to discover the biggest tiger reserves of the nation by rail route and to create awareness of conserving the Tigers, which is also the national animal of India. Indian Railways will give semi luxury rail facilities in this rail tour for the passengers. The journey will start from Delhi and cover the two famous national parks – Kanha and Bandhavgarh. In addition to this, the Railway Minister also hinted of more upcoming railway tours like Elephant circuit, tour to the deserts, etc. in near future. The Indian Railways will provide semi luxury train in this Tiger tour for the nature lovers which will be air conditioned. The Interiors of the train coaches will be decorated by wildlife and tiger themed pictures and placards which will contain information and pictures of tigers and their habitat. The guests will also get to stay in three star hotels after reaching the tour spots. Three nights out of the five nights will be spent in these 3 star luxury hotels by the guests. So the entire journey will be a mix of thrill, adventure, wildlife safari and sweet rail journey and luxurious hotel stay. IRCTC will be arranging the complete tour package from tour booking, hotel booking, tour guide engagement and providing food in the train. The tour will have efficient tour guides who will guide the guest the entire tour. For the first time in the history of Indian railways, a semi luxury train will have a separate dining coach facility available. Earlier, this facility was available in the Maharaja Express which had presidential luxury suits and the tariffs were much higher. 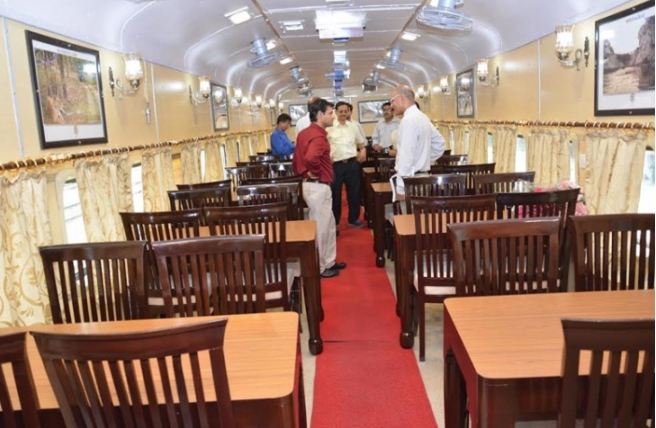 In the Tiger Express, a coach will be dedicated only for dining and recreation where the guests may assemble for dining and get involved into interactions with one another. There will be two types of occupancies open for booking in the Tiger Express. One will be 1st class AC and another will be 2nd class AC available for the rail journey. For 1st class AC occupancy in the Tiger Express, the rate for single occupancy is Rs. 49,500 per guest. For double occupancy in 1st class AC, the tariff is Rs. 45,500 per guest. There is also option of triple occupancy in the 1st class Ac compartment which may be beneficial for families with per person tariff of Rs. 44,900. Along with this, for children who are between the age of 5 years to 11 years will be charged Rs. 39,500 for 1st class Ac accommodation in Tiger Express. Children above 11 years of age will be considered adults and will be charged accordingly. 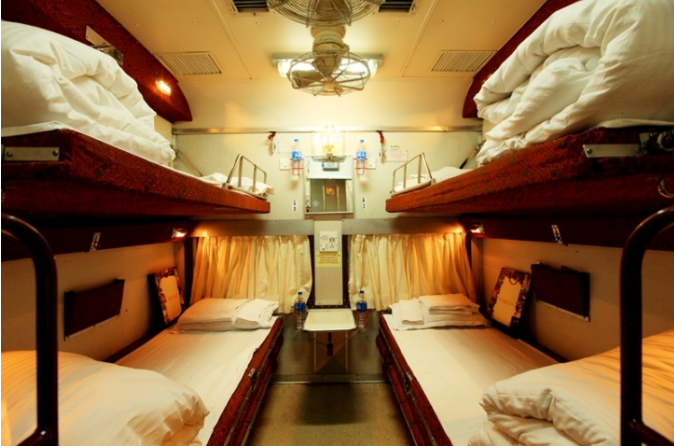 Another option of train accommodation for the guests is 2nd class AC accommodation in Tiger Express. AC 2 tier births will be provided to these guests. For single occupancy, the tariff rate per person in 2nd class AC is Rs. 43,500. For having a double occupancy in hotel and enjoying 2nd class AC facility, tariff per person is Rs. 39,000. The triple occupancy charge for 2nd class AC travelling per guest is fixed at Rs. 38,500. The children from the age group of 5 years to 11 years will be charged Rs. 33,500 in AC 2 tier rail journey. The bookings must be made well in advance before the start of the tours. Total tariff must be paid for booking for the Tiger circuit tour by train. Indian citizens will have the above mentioned tariff rates for the entire tour. However the foreign nationals are charged extra for entry and safari tour in the Kanha and Bandhagarh National Parks. So their per-person tariff will include this extra cost. As a result, the foreign nationals will have to pay an extra of Rs. 4,000 per guest for this railway tour. The other rates are same as for Indian citizens. This railway conducted tour is expected to attract many foreign guests on board. The Kanha National Park is located in the state of Madhya Pradesh and is the largest national park located in the central part of India. It has an area of around 940 sq Km. The park is famous for its Royal Bengal tigers, Barasingha, leopards, swamp deer, sloth bear, etc. The popular novel named ‘The Jungle Book’ has got inspirations from this park only. The Bandhavgarh National Park has a total area of 437 sq Km. With high bio-diversity, this national park has got a dense population of Indian tigers. Several deer species and leopards are also sighted in this park. One can also spot the famous white tigers. The guests will assemble in the Safdarjung Railway station for initiation of the journey. The Tiger express will leave the Delhi’s Safdarjung Railway station on Day 1 of the tour. The departure time of Tiger Express is 15:00 hours. The night will be spent in the semi luxury coaches of the Tiger Express. The guests will be provided snacks and dinner. Dinner will be done in the dining coach, which is dedicated only for dining. The Tiger Express will reach its next destination in the next early morning. In the 2nd day of the tour, the Tiger Express will arrive to the Katni Railway station in the early morning. The arrival time is 05:45 hours. The breakfast will be provided to the guest inside the train only. After that they will be taken for the hotel check-in in Bandhavgarh. The hotel will be a three star or equivalent luxurious hotel. Lunch will be provided in the hotel itself. Evening safari in the Khitauli zone will be done followed by dinner and overnight boarding in the Bandhavgarh hotel. After morning breakfast, the guest will be checked out from the Bandhavgarh hotel and will be taken to the railway station. At 11:00 hours in the morning, the Tiger Express will leave for Kanha. After reaching Kanha, they will check in and have lunch in the hotel. For the Mukki zone, evening wildlife safari will be organized. The dinner and over-night stay will be at the Kanha hotel. The entire 4th day of the tour will be spent in Kanha itself. Mukki Zone’s morning safari will be done in the early hours followed by outdoor breakfast. Lunch will be provided in the hotel. The evening is for leisure and shopping where the guests may go out to explore local markets. The dinner and overnight boarding will be done in the hotel. In the morning, breakfast will be served in the Kanha hotel to the guests. After that guests will check out the hotel and go to the Kanha railway station. Train will leave for Jabalpur which is 135 KMs away from Kanha. The guests will check in at the hotel and have their lunch. After having lunch, an additional attraction of Dhuadhar Waterfall located in nearby area named Bedhaghat is awating. In the evening, they will taste the flavor of high tea, before checking out of the hotel and moving to railway station. The dinner and overnight boarding will be done in the Tiger Express only. The departure time of Tiger Express from Jabalpur is 22:05 hours and the train will reach Delhi the next day. In the morning, the guests will be given breakfast, followed by lunch in the noon. The time of arrival of the Tiger Express is 15:50 hours in the Safdarjung Railway Station in Delhi. The tour ends here and the passengers will have happy memories of the wildlife tour with them.